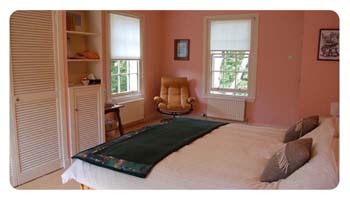 Cortachy House B&B rooms are furnished to a very high standard and offer great levels of comfort and privacy. 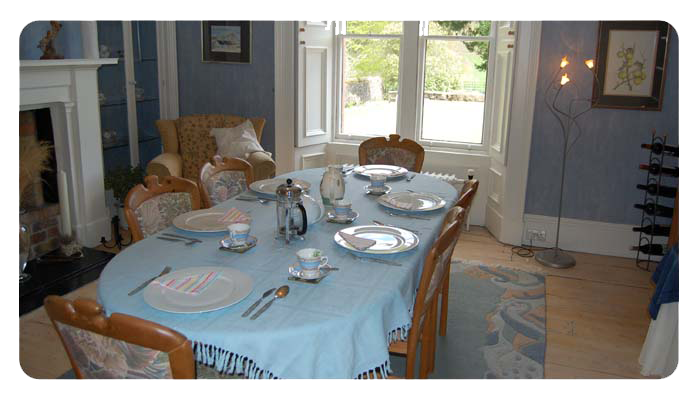 Cortachy House B&B offers two large bedrooms with private facilities. 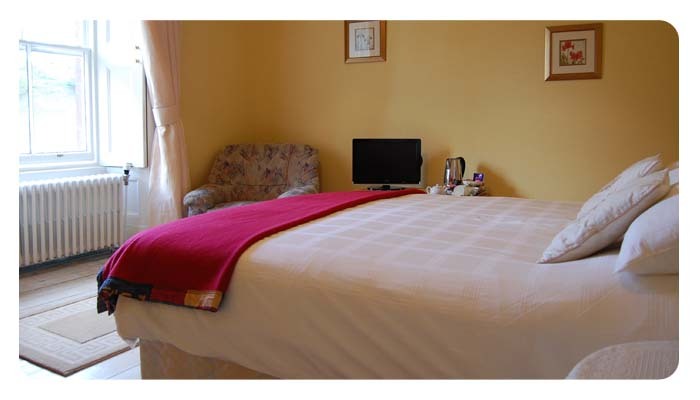 Each bedroom has Sky TV, Coffee & Tea, Towels, and Wireless Internet. Bed and Breakfast prices from £60 per room per night. Clova Bedroom is a very large south facing double room with en-suite facilities. The room itself is bright and spacious and overlooks the terraced lawns and paddocks to the front of the main house. Clova is equipped with satellite television, Wi-Fi Internet access, hospitality tray, hair dryer, bathrobes and high quality linen. 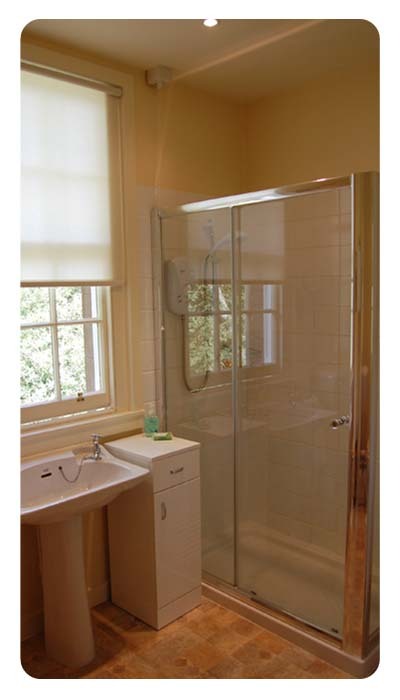 The en-suite includes a very large shower cubicle with an excellent shower and high quality towels and accessories. 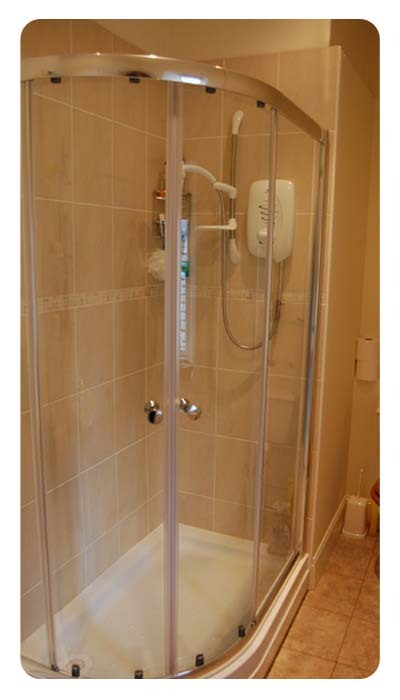 Clova has its own integral door which closes it off from the rest of the house thus ensuring complete privacy. 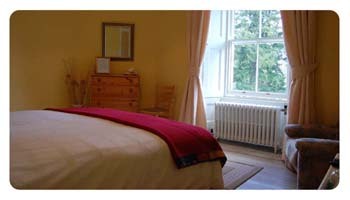 Clova Guest Double Room Rate is £85. Reserve this room by completing the B&B Reservation Form or call (01575) 540229. Prosen Bedroom is a large triple aspected double room situated in the newer portion of the house. Prosen Bedroom is equipped with satellite television, Wi-Fi Internet access, hospitality tray, hair dryer, bathrobes and high quality linen. Prosen has its own private facilities comprising of a double shower and again comes equipped with high quality towels and accessories. Prosen is situated in its own wing of the house and thus retains a very high level of privacy. Prosen Guest Double Room Rate is £75. 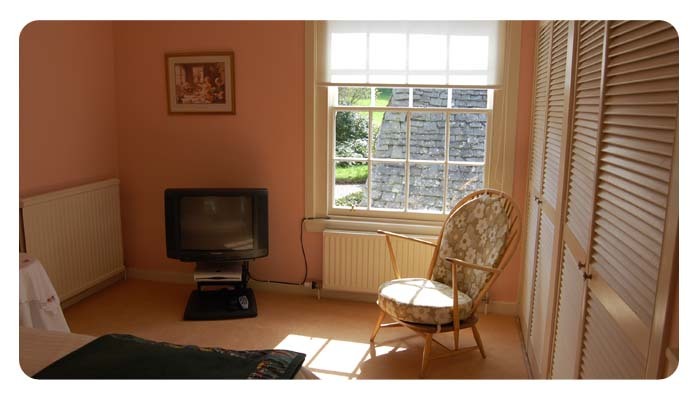 Reserve this room by completing the B&B Reservation Form or call (01575) 540229. 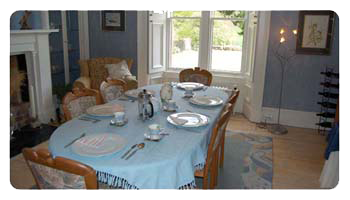 The Breakfast Menu consists of cereals, porridge, fruit juices, fresh fruit and toast followed by a full Scottish breakfast comprising of any of the following : local free range eggs to your liking, award winning bacon, sausage and black pudding, mushrooms, tomatoes, beans and fried bread. This breakfast feast comes with unlimited supplies of tea and coffee, both filter or instant. Special dietary requirements will always be catered for. Evening meals and packed lunches can be supplied if prior notice is given. Heather is a very enthusiastic, experienced cook who produces well balanced, hearty meals based on locally sourced products. Special dietary requirements will always be catered for.